This page has been viewed 2,825 times. It’s no secret that I am a big B.C. wine fan. In fact, I try to order it as much as possible when I dine out to help support what I believe to be a truly underrated and undiscovered product. And even though B.C’s reputation as a wine growing region is still relatively unknown to the world – I have a funny feeling that is about to change. On November 3, 2008, Inniskillin (a global wine icon which has wineries in both the Okanaga and Niagra regions), launched its commemorative Icewine created by winemaker Bruce Nicholson. Labelled with the unique artwork of Canadian Artist Gord Halloran, a portion of the proceeds from every bottle sold will support the Canadian Olympic team and the Vancouver 2010 Olympic and Paralympic Winter Games. Athletes and owners were on hand to celebrate as Vancouver 2010 draws nearer and nearer. My advice, load up now and stock the wine cellar before the world comes to Vancouver in 2010 and discovers just how good we’ve had it all this time. 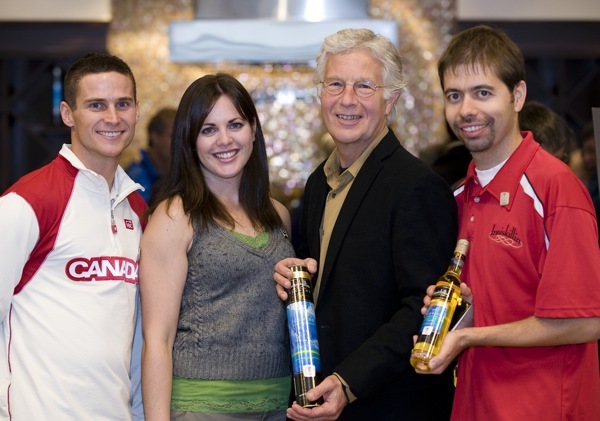 Olympic Athlete Freestyle Skiers Steve Omischl and Deidra Dionne, renowned BC artist Gordon Halloran (whose work is featured on the label) of Paintings Below Zero, and Scott Starra of Inniskillin Wines.